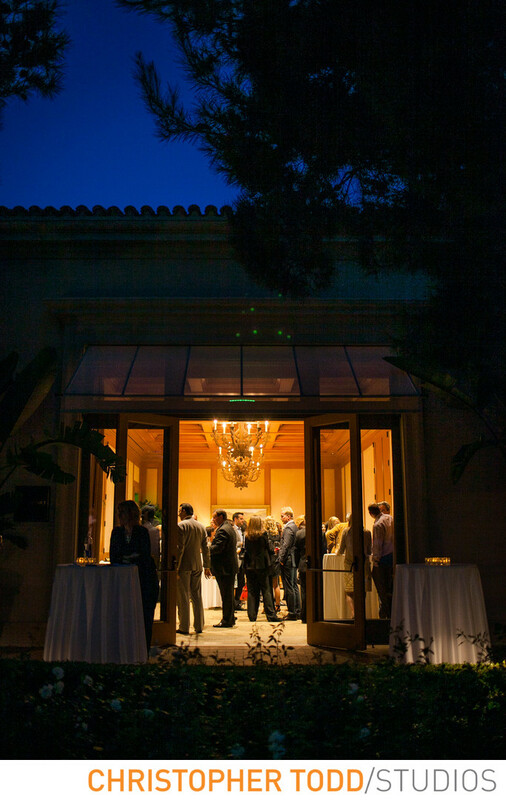 As an Event photography in Newport Beach, I will often find myself working with exclusive clients. This session was no different when I was hired by Christie's of London to photograph a preview of selected gems and jewelery about to go to auction. The most talked about item Was the Ring Jennifer Lopez aka J.Lo Gave back to Ben Affleck after calling their engagement off. Just a mere $2.5 million, 6.1-carat pink diamond Harry Winston engagement ring. I can honestly say I was scared to look at the armed guards that traveled with the lots of jewels. They looked like models. Immaculately dressed in Italian suits with perfect hair and hard jawlines, but had nothing but death in their eyes. I captured this photograph during a short break when I noticed the striking complimentary colors of warm light in the ballroom and the cool blues in the evening sky. The invitees were milling about looking and trying on jewelry worth more than houses just up the street in Newport Beach. 1/60; f/1.8; ISO 1000; 35.0 mm.